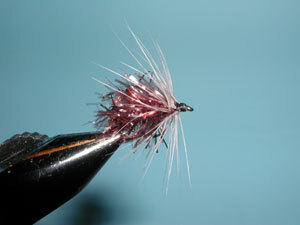 Notes: This pattern was developed by Ralph Cutter, local guide out of Nevada City, CA. 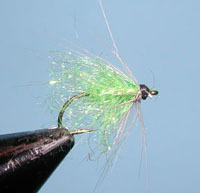 A simple fly to tie, Ralph attributes it's success to the translucent Chenille that emits a perfect glow and the hackle which gives a halo sillouette to the fly appearance from under the water. But readily admits that "any old beetle pattern probably works just as well". Fish this pattern where snails are abundant, especially in alkaline lakes. Look for snails in the foam lines or shorelines of the lakes. 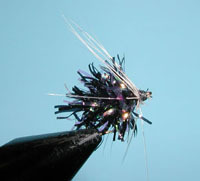 Use a floating line with a greased leader within 2 inches of the fly.